It's an argument that has been going on for a century but was largely dormant over the quarter-century of low-inflation economic growth that followed the Ronald Reagan tax cuts. It's been raised again by the expand-government policies of the Obama administration and Democratic congressional leaders. Those policies, thoroughly in line with the Progressive tradition, have been advanced by liberal elites in government, media, think tanks and academia. The opposition, roughly in line with the Founders tradition, has been led by the non-elites who spontaneously flocked to tea parties and town halls. Republican politicians have been scrambling to lead these protestors. The conservative rebellions of the late 1970s and middle 1990s were focused on taxes. 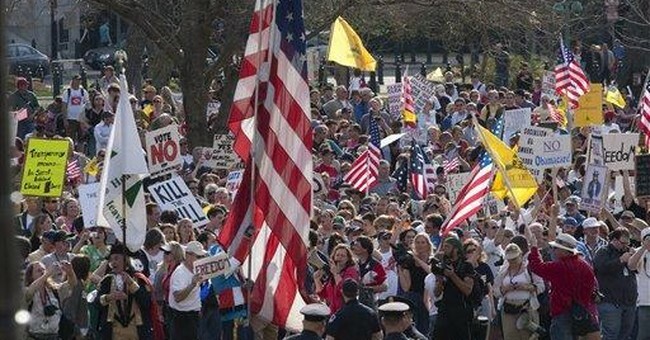 The tea partiers are focusing on the expansion of government -- and its threat to the independence of citizens. The first mention of tea parties came in February 2009 from CNBC's Rick Santelli on the floor of the Chicago Mercantile Exchange, when he asked "if we really want to subsidize the losers' mortgages. How many of you people want to pay your neighbor's mortgage, that has an extra bathroom and can't pay their bills?" Then he called for a Chicago tea party. This struck a chord. Tea partiers began to dress in 18th century costumes -- political re-enactors -- and brandished the "Don't tread on me" flag. They declared their independence by opposing Progressive policies that encourage dependence on government. The Progressives have always assumed that people needed safety nets and would welcome dependence on government. The public's clear rejection of the Democratic health care bills has shown that this assumption was unwarranted. Americans today prefer independence to dependence on government, just as they did 200 years ago. All this was supposed to have been consigned to the past long ago. The Progressives of the early 1900s -- Presidents Theodore Roosevelt and Woodrow Wilson, New Republic founder Herbert Croly -- argued that in an industrial era of mass production and giant businesses, ordinary people were helpless and needed government's guiding hand. It would be more efficient, they argued, for centralized, disinterested experts to administer national institutions than to let chaotic markets operate freely and to observe the Constitution's horse-and-buggy limits on government power. The Founders were out of date. The Progressives had their way for much of the 20th century. But it became apparent that centralized experts weren't disinterested, but always sought to expand their power. And it became clear that central planners can never have the kind of information that is transmitted instantly, as Friedrich von Hayek observed, by price signals in free markets. It turned out that centralized experts are not as wise and ordinary Americans are not as helpless as the Progressives thought. By passing the stimulus package and the health care bills, the Democrats produced expansion of government. But voters seem to prefer expansion of liberty. The Progressives' scorn for the Founders has not been shared by the people. First-rate books about the Founders have been bestsellers. And efforts to dismiss the Founders as slaveholders, misogynists or homophobes have been outweighed by the resonance of their words and deeds. The Declaration of Independence's proclamation that "all men are created equal" with "unalienable rights" to "life, liberty and the pursuit of happiness" has proved to be happily elastic. It still sings to us today, thanks to the struggles and sacrifices of many Americans who gave blacks and women the equality denied to them in 1776. In contrast, the early Progressives' talk of an "industrial age" and an outmoded Constitution sounds like the language of an age now long past. Their faith in centralized planning seems naive in a time when one unpredicted innovation after another has changed lives for the better.